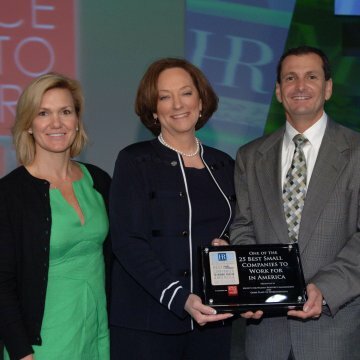 Home/News/ENGEO is Honored Nationally As One of the 25 Best Places to Work – 2nd Year Running! For the second year in a row, ENGEO Incorporated has been named one of the top 25 Best Small & Medium Companies to Work for in America. The list was announced on June 23rd before an audience of more than 20,000 at the Society for Human Resource Management’s (SHRM) 59th Annual Conference & Exposition in Chicago. This annual list, now in its fourth year, ranks the top 25 small and top 25 medium-sized companies in America that use smart people management strategies to develop successful organizations with highly productive and satisfied workforces. The organizations, ranging in size from 50 to 999 employees, were announced by SHRM and selected and ranked by the Great Place to Work® Institute (GPTW). The results were based on a randomly distributed employee opinion survey. Each company evaluated was given a score based on employees’ responses to a detailed questionnaire about the organizations’ workplace cultures. ENGEO is a 200-person, employee-owned engineering consulting firm of geotechnical and civil engineers, geologists, hydrologists and environmental professionals as well as a large construction services QA/QC team. Founded in 1971, ENGEO is very selective in hiring and attracts some of the best technical professionals in the business. ENGEO serves projects in transportation, infrastructure, water resources, geologic hazards, flood control, critical facilities, residential and mixed-use communities, urban infill, Brownfields and transit oriented developments.